Winter is still here and you can’t go wrong with butternut squash. We had stored one in our cupboard in December and it was still sitting there behind the onions waiting for me. This recipe takes butternut squash to a new level with some added flavor. I add this to some my lunch by tossing it into my salad or serving it on the side of just about anything. It can be hot, cold, or room temperature. Keep in mind that one serving of this colorful dish give you 482% of your daily value of vitamin A, 80% of your daily value of vitamin C, and 23% of your daily value of potassium. 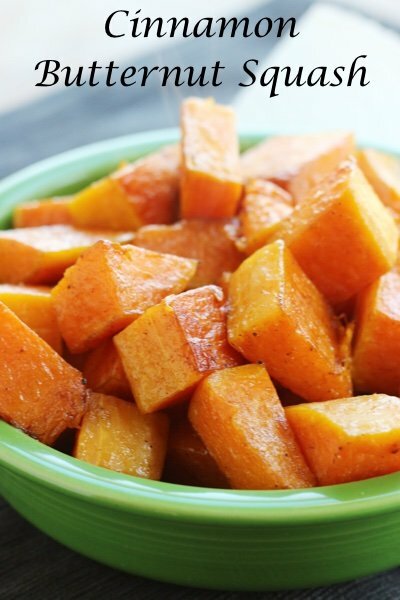 Even if you hate butternut squash, this recipe is worth a try. Go ahead and use the pre-packaged cut up squash if you don’t have time to cut it up yourself (it IS a pain). Lisa this sounds good to me. I actually have a bag of the frozen butternut squash in the freezer. Going to try this today to go along with the spiral ham I'm making for dinner. Is there any way to make this without adding some kind of sugar or sweetner? We are being told to reduce sugar in our diets and yet it seems like the more recent recipes I've read - Clean Eating Magazine, your website, etc. - sugar of some sort s added to everything. Any suggestions would be appreciated. I would just leave out brown sugar and a a drizzle of 2 tsp. maple syrup. I love butternut squash, or anything containing it! I am definitely going to give some the slow cooker treatment. As for the yummy cinnamon version, I'm defitely sold on it. I'm going to try it using avocado oil which I've just started using to replace olive oil n several of my favorite recipes. How about trying agave syrup-would that work instead of the sugar? I love love butternut squash fries!! This will probably be amazing too!! No need for any type of sweetener. Roasted butternut squash sweetens up on it's own. I throw in a tablespoon of coconut oil, a little salt and pepper, and roast in the oven for at least an hour on 400 degrees! I toss it around once or twice during the hour. I always get the butternut squash already cut up at Trader Joes or the grocery store! 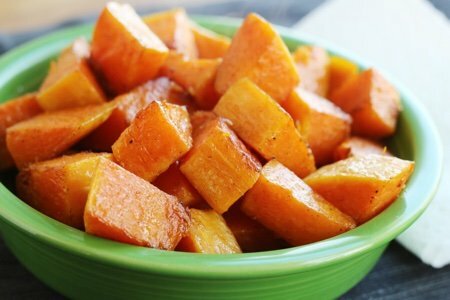 I make similar roasted butternut squash...I added a hint of maple syrup. Will try adding cinnamon next time. Do you have a cup measurement for the squash as I do not have a scale. Have no idea what 3 lbs. might be. Fingers crossed. We made this tonight. I only used 1 teaspoon of sugar. I microwaved the cut up squash, seasonings, and oil for about 7 minutes. Then I roasted it in the 400 degree oven for 12 minutes where it caramelized perfectly. It was delicious and I think I will completely leave out the sucanat next time because I think it would taste fine without it. What is the conversion from smart points to points plus? What a great combination - butternut squash and cinnamon - makes me look forward to fall! Sounds wonderful. will try this with T.J. cut up squash and also cook one in my slow cooker. This is I THINK MY FAVORITE VEGGIE.! tHANKS! My daughter's recipe -- Skin and cut up squash, several onions, some garlic cloves, and maybe a potato or two, some fresh mushrooms, even a few cut-up carrots/turnips/parsnips or whatever you have... mix in a baking pan, drizzle with olive oil and salt, pepper as you like. Roast for an hour or so, stirring every 15 minutes or so. Incredible! !